Whether your upgrading your apps to iOS 7 or building a new app, you may come across the following warning in your storyboard: Misplaced View Frame for “Label – Label” will be different at run time. To solve this, select the view/label in question and click Editor then mouse over Resolve Auto Layout Issues. This brings up a number of options. 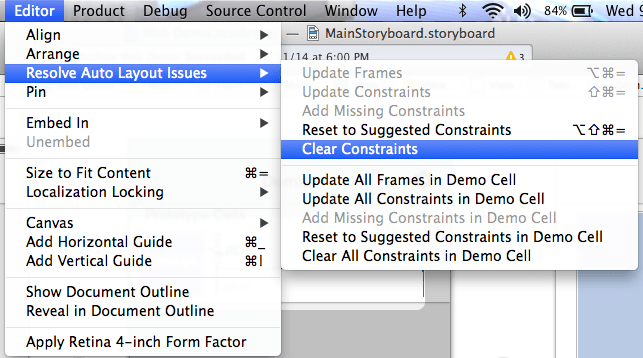 The easiest solution is to select Clear Constraints and then reorder the objects in your view. Another solution is to select Reset to Suggested Constraints. On most occasions this has worked for me without having to rearrange anything. On one occasion, however, it totally screwed my view up and I had to literally remove and re-add my objects. I haven’t messed around with the other options so if you find a better solution, let me know.